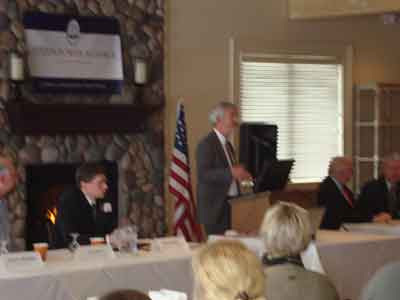 The 2/16/10 Citizen Power Alliance (CPA) Wind Conference at Bristol Harbor on Canandaigua Lake drew close to 200 elected officials, state representatives, news media and CPA members from across NYS to discuss the industrial wind issue. The meeting was specifically designed to elicit greater awareness and involvement by NYS elected representatives and news media regarding the realities of industrial wind in New York State. CPA's panel of presenters for the meeting included NYS Town Supervisors & Board members, business owners, and an environmental attorney who have all had years of experience and great frustration in dealing with the industrial wind issue in their respective communities. Congressman Eric Massa was originally scheduled to address the meetings' attendees, but was unable to attend due to Congressman John Murtha's funeral. Congressman Massa's representative, David Marion, read Massa's letter to President Obama (See: Massa Letter Link). Massa's letter calls on President Obama to address the questionable use of $115 Million dollars of stimulus money paid out to First Wind for projects already built, which fail to create any jobs, and is, for the most part, going overseas -- contrary to what the Stimulus money was intended to do. 4.) to set forth goals and recommendations for elected representatives to strive for in order to protect the health, safety, well-being, and property values of ALL of their constituents, while also protecting the priceless legacy of NYS's irreplaceable natural landscapes for future generations. 1.) Amendments to SEQRA that require lead agencies to use independent third party firms - not those brought in by the wind industry, which is currently what is happening. 2.) Statewide noise and setback standards for industrial wind turbines that will fully protect the health, safety, quality of life, and property values of neighboring residents. 3.) Accurate coverage by news media (which has been sadly lacking to date), who have taken the time to educate themselves on the issue instead of simply repeating false claims made by wind industry salesmen, which is what typically happens (i.e. - 'homes served' claims). 4.) An audit of NYSERDA regarding: a.) the hiring of wind industry lobbyists to develop the industrial wind Production Tax Credit (PTC) and other Renewable Portfolio Standards (RPS) regulations, and b.) the payment of over $200 Million from the Systems Benefit Charge (SBC) account to industrial wind companies - monies that were intended by the legislature to be used to improve the energy efficiency of state operations. 5.) A comprehensive investigation by the Attorney General's Office into the predatory and illegal tactics used by Big Wind LLCs across NYS, including: market allocation, price fixing, larceny, extortion, conspiracy, filing false instruments, mail fraud, etc. 6.) Audits of IDAs for ongoing refusal to acquire and maintain data on actual job creation and other economic benefits for projects that have PILOT or other tax abatements. 7.) An investigation into the 2009 decision by the DOE to pay out hundreds of millions of dollars in stimulus money to existing wind projects - monies that have not, and will not create a single new job. 8.) Support from our state representatives for the Protection of Home Rule. Citizens from communities across NYS who comprise CPA are simply asking for responsibility and accountability from our elected officials and state agency representatives in their positions of public service. Likewise, since honest information is the key to our freedom, CPA seeks adequate, educated coverage of this extremely divisive, complex issue from the news media. In the views of CPA members, these actions are not at all too much to ask for if we truly value our democracy, and wish to prevent ratepayers, taxpayers, and our environment from being exploited by financially-motivated mega-corporations/LLC's. 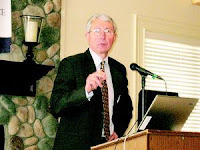 I am notifying you and Citizen Power Alliance that assertions I made at last week's CPA-sponsored program on industrial wind energy regarding Dr. Nina Pierpont's book, Wind Turbine Syndrome, reflect the views of wind project developers. Specifically, I said Dr. Pierpont's book has not been peer-reviewed, by which I meant the book had yet to be reviewed in professional journals in the subject area of the book. However, I understand the book was peer-reviewed prior to publication. In any case, I now believe that Dr. Pierpont's book has been peer-reviewed, and the blanket assertion that it has not has been promulgated by wind developers at public meetings I have attended. Their view is not mine. I hope this clarifies any confusion created by my remarks. South Bristol, N.Y. — State and federal authorities have largely ignored the needs of rural communities faced with pressure from industrial wind turbine developers. That was the message delivered Tuesday during a more than three-hour forum at Bristol Harbour Resort sponsored by Citizen Power Alliance. Town supervisors from as far away as Wyoming County spoke on the panel that included an environmental attorney and Naples Town Supervisor Frank Duserick. The panelists said their repeated calls for inquiries into the practices of wind turbine companies have fallen, for the most part, on deaf ears. A number of communities are in legal battles with wind developers, including Italy in Yates County and the neighboring town of Prattsburgh in Steuben County. Concerns center on health and safety issues associated with noise from turbines close to homes, as well as government subsidies for the wind projects. Duserick said when his town complained last year to state authorities about the siting of wind turbines in neighboring Cohocton that were too close to the Naples town line, it got little response. But Mary Wilmot, a representative from Gov. David Paterson who attended the forum, objected to criticism, saying she has been in contact with event organizer James Hall since September and has not been informed of any complaints. Though dozens of state and federal lawmakers were invited to the forum, few sent representatives. However, U.S. Rep. Eric Massa, D-Corning, sent two. Massa had a letter read, that he has sent to President Barack Obama, calling for “responsible funding” of wind projects. Charles Bliss, an engineer with the state Department of State, attended the forum and answered questions about local laws. Hall said he believes the event succeeded in getting the attention of those in power. The alliance is now planning a meeting with the top federal official with the Department of Energy advising Obama, he said. “It’s been a long fight,” said Italy Town Supervisor Brad Jones. The town spent some $65,000 in December alone on legal fees in fighting a lawsuit against wind farm developer Ecogen Wind LLC, he said, a cost the town can ill afford. “Industrial wind has changed our lives,” he said. In recent months, I have learned of some very troubling news regarding the use of stimulus funds for supporting wind industry jobs abroad. I do not believe this use of U.S. taxpayer dollars is in accordance with the purposes of the American Recovery and Reinvestment Act and I request that your Administration refrain from giving any awards to wind companies tunneling money to foreign corporations. Sending money abroad to support jobs in other countries while continuing to ignore problems facing the American wind industry is simply bad policy. To date, I do not believe the use of stimulus funds to support wind projects in the U.S. has met the promises of substantial job creation and clean renewable energy. With these and other federal funds, we must make wise investments in the American people by weighing the job and energy creation prospects of each proposal. Quite simply, the potential benefits offered by a project should be commensurate with the size of the investment. I am not convinced that this is the case right now. While it is true that these funds are used only to support American-based projects, the development corporations and the suppliers involved are, more often than not, headquartered outside of the U.S. This means that ultimately, a large portion of the nearly $2 billion invested in wind projects through the ARRA will go directly to supporting foreign businesses that compete with American workers. The stimulus package was meant to bolster American productivity, not hand over control of an entire industry to other countries, including China. Instead of dumping billions of dollars into so many wind projects that support very few domestic jobs and produce limited energy benefits, while propping-up foreign industries at the expense of U.S. taxpayers, I believe your Administration should focus on addressing the underlying problems of the American wind industry. If we are to have successful American wind energy development, we must have an industry built by American workers that supply real energy to American homes and reduce our dependence on dirty fossil fuels. I believe it is necessary to slow down the wildly haphazard "progress" in wind power development which is having a destructive impact on many small communities. We need to address these and many other concerns because frankly, the current policy is not working. As it stands now and as it has been proven by stimulus investments in wind power, our nation is dangerously reliant on foreign wind corporations. As with so many other industries, we have been surpassed by our foreign competitors in the wind sector. Even worse, now we are funding them. This is entirely wrong. Moving forward, we must take a critical look into the American wind industry that we see today and develop comprehensive, long-term plans that address the many serious issues facing wind power in this country. The goal must be to use wise investments in this energy source to safely, responsibly, and effectively create clean energy while also establishing strong manufacturing and construction sectors that will build a truly American industry supported by American jobs. A renewable energy company is planning to build 75 windmills that are about 475 feet tall, and the majority will likely be constructed in the town of Hammond. Iberdrola Renewable Inc. made the decision at a Town Hall meeting recently. The towers are about 66 feet taller than a similar wind farm in Lewis County. The company says it is still looking at wind levels in Morristown, but it appears Hammond will be home the majority of the turbines. A special meeting has been scheduled at 7:30 p.m. Feb. 22 at the Hammond Free Library to review applications for the Wind Advisory Committee. The committee will help establish guidelines for the town's wind facilities law. 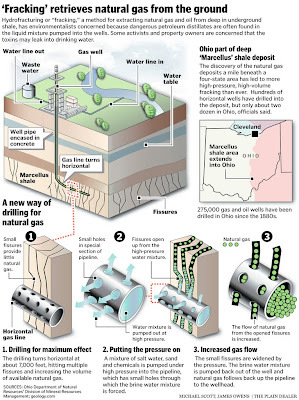 What to do with Marcellus Shale waste? Chesapeake Energy, one of the country's largest natural gas drilling companies, has proposed disposing of it beneath the scenic heart of the Finger Lakes Region. The plan to inject 181,000 gallons of industrial waste per day into a defunct well in the Town of Pulteney has met with stiff opposition from residents. It has also produced mixed signals from Chesapeake. Company officials say they have no intention of executing the plan. Yet, they also have no intention of withdrawing permits from federal and state agencies necessary for them to proceed. Nationwide, concerns are especially acute over horizontal drilling -- which sometimes triple or quadruples the amount of frack fluid used -- and fracking in the deep Marcellus shale formations in New York, Pennsylvania and into the eastern third of Ohio. One national environmental group recently rapped drilling companies nationwide for injecting toxic petroleum distillates into thousands of wells. The Environmental Working Group focused on benzene -- a "known human carcinogen that is toxic in water at even minuscule levels," the report said -- found in some of the petroleum distillates used by drillers. Tariff filings from six utilities participating in a net metering initiative—including Rochester Gas and Electric Corp. and New York State Electric & Gas Corp.—were approved Thursday by the state Public Service Commission. The metering initiative is designed to encourage customers to install residential micro-combined heat and power systems and fuel cell electric generating systems that will enable homeowners to sell excess power to their utility, PSC officials said in a statement. “The initiative will provide long-term benefits to the environment and to the economy,” PSC chairman Gary Brown said. “As a result of our decision today, a homeowner can install these newest technologies and receive a credit from the utility for the excess electricity that’s been created, or sell it to the utility and pocket the money,” Brown said. The response is similar that of company CEO Aubrey K. McClendon’s comment in a two-page letter dated Feb. 2 to U.S. Rep. Eric Massa, D-Corning. “As a result, we are no longer actively pushing for resolution of our local permit request,” McClendon writes, in reference to state and federal permits required to open a wastewater dump. Plans by Chesapeake to locate an underground wastewater dump within a mile of Keuka Lake have created an uproar in the town and throughout many local communities that border the deep, freshwater lake. An informational meeting Sunday drew more than 500, most of whom are against the plan. Town Supervisor William Weber did not respond to Leader requests for comment Thursday. More than 100 town of Pulteney residents attending a standing-room-only meeting Wednesday told the Town Board not to do business with Chesapeake Energy. The board required little prompting to oppose Chesapeake’s plan to build a wastewater facility in the town – but stopped short of a passing a preliminary resolution to enact a moratorium on any wastewater projects. Instead, the board unanimously passed a resolution to lay the groundwork for a moratorium, including the length of time needed to draw up land use regulations, road use agreements, and other issues. “I think everybody here, everybody in town, should just write letters to (Chesapeake CEO Aubrey K.) McClendon telling him we don’t want him here,” said one resident, who was concerned a moratorium would not be enough to keep the wasterwater facility out of Pulteney. This story gets more absurd by the day. An article in the Syracuse Post Standard last week assailed National Grid for applying to the PSC for a 20% rate increase to "cover operating costs". When question about the necessity of yet another electricity rate hike on top of New York's already prohibitive rates (only Connecticut and Hawaii are higher), a National Grid spokesperson said the increase was necessary because consumers were conserving so much electricity that sales were not high enough to cover their operational costs. Now in the Times article we see that a proposal will be put forth to connect Galloo into the National Grid substation on Rte 12E north of Salmon Run Mall, and that they (National Grid) would continue to own the substation after upgrades are made to handle the Galloo input. Think about this for a minute; one of the states largest utilities cannot sell enough electricity to cover operating costs so they want a price increase of 20%; as the price goes up, consumers conserve more and all the while the output of wind farms adds to the available supply on the power grid. Less consumption, more supply, higher costs to cover expenses??? When will common sense prevail and greed and poor business management be recognized for what they are?? A continuing rep-off of New York's utility consumers!! On a separate but connected note it is reassuring to see that Governor Paterson is looking out for the welfare of his constituents (the citizens of New York State) by trying to balance the states budget. How can we thank him enough for cutting aid to hospitals, schools, tuition aid programs, library's and countless other (non-essential??) public programs, while he continues to hand over hundreds of millions of dollars to off-shore wind-farm investor groups. How silly and ungrateful of us not to understand and appreciate the public-good in all of this! Why don't we understand the value in closing the nursing facility at River Hospital in Alex. Bay; of course pre-K children don't need to go to school; why can't every college student pay ever increasing tuition from decreasing student loan funds? ALBANY — Staff members at the State Public Service Commission are arguing that New York State Electric & Gas’ proposed rate increase is too high. Rochester-based NYSEG, which provides electric and some natural gas service to 175,000 customers in suburban and rural portions of upstate New York, is seeking to raise annual gas and electric rates by $215 million statewide. Such an increase would add nearly $40, combined, to the average monthly gas and electric bill. The five-member commission, which regulates utilities in the state, must approve the rates. But in testimony filed as part of the case, which is expected to conclude by August, staff at the PSC say NYSEG cannot justify such a high increase. The estimated population of Pulteney is about 1,300. At times Sunday it looked like every one of them was crowded into the Pulteney Fire Hall to discuss the proposed plan to deposit contaminated wastewater in a former natural gas well. More than 300 people came to hear a panel discuss the plan. Chesapeake Energy approached Pulteney officials last fall about the plan to dump the wastewater, which is generated from the hydrofracking process, into a well about a mile west of Keuka Lake. Around the same time, Chesapeake submitted a permit application to the U.S. Environmental Protection Agency to convert the old well into a disposal well. Injection wells are a method used by gas drilling companies to dispose of the waterwater created by high-volume, horizontal hydraulic fracturing – or “fracking” – which is a process used to tap the gas-rich Marcellus Shale formation. Wind-energy developers, who have flocked to the breezy hills south of Rochester, now are finding parts of the region a less-than-hospitable one. A cross-border project has been blocked by local officials in Steuben and Yates counties, prompting aggressive lawsuits by the developer involved. Another wind-energy company just walked away from a planned project in Steuben County. And most recently, a Wyoming County citizens group has challenged a town board action that paved the way for a new wind project there. Some say the shine has worn off an industry that in many communities had been welcomed both for its green image and its ability to pump money into the local economy. Poor National Grid. Its shareholders only earned a 5 percent return last year. As Tim Knauss reported Jan. 30: “The British company’s top executives expect their business units to earn at least 10 percent return.” So they want the Public Service Commission to approve a 20 percent hike in electric delivery prices above what the current plan through 2012 allows. Of course, National Grid’s senior vice president of rates and pricing proposes an accounting gimmick “that would make room for a $390 million (per year) increase in rates without raising customer bills.” Do they think we were born yesterday? National Grid cites energy conservation and the recession for reducing its sales. Energy conservation is supposed to be a good thing, not something that results in higher rates to maintain corporate profits. And the recession is already hitting everyone; shouldn’t National Grid eat its share? New York already has the 49th highest electric rates in the country (out of 50 states and Washington, D.C.), according to the U.S. Energy Information Administration. Only Connecticut and Hawaii are higher. It seems to me that increasing our rates further will only drive more energy conservation and deepen the recession locally by exasperating the already challenging business climate in the region. So, by National Grid’s formula, which will become precedent if the PSC approves it, electric delivery rates will be locked in an upward vortex. If National Grid needs to bolster revenue to maintain and upgrade its distribution network, then let any approval by the Public Service Commission be narrowly allocated for infrastructure. As resistance to a proposed Chesapeake Energy toxic wastewater disposal facility near Keuka Lake grows, Pulteney Town Supervisor Bill Weber is vowing to do everything in his power to stop the project. Weber has asked the town’s attorney to investigate the possibility of imposing a moratorium on such projects, and the Pulteney Town Board will discuss the matter at its next meeting on Wednesday. “There’s no way I’m going to support this, and I have confidence that the town of Pulteney will find a way to stop it,” Weber said. Chesapeake Energy has applied to the federal Environmental Protection Agency and the state Department of Environmental Conservation for permission to build a facility in Pulteney to dispose of wastewater from its Marcellus Shale natural gas drilling operations. ALBANY -- Staff members at the state Public Service Commission are arguing that New York State Electric & Gas's proposed rate hike is too rich. Rochester-based NYSEG, which serves about 45,000 customers in the Capital Region, is seeking to raise annual gas and electric rates by $215 million statewide. Such an increase would add nearly $40, combined, to the average monthly gas and electric bill. The five-person commission, which regulates utilities in the state, must approve the rates. But in testimony filed as part of the case, which is expected to conclude by August, staff at the PSC say that NYSEG can't justify such a high increase. Instead, they urge that the company be allowed to raise electric rates by $27 million and keep gas rates the same. In a filing made on Jan. 25, PSC staff members say that NYSEG and its sister company, Rochester Gas & Electric, are proposing an "unprecedented" amount of new spending that will have a "massive impact" on rates. As tension builds about when the Vermont Legislature will vote to allow or deny a 20-year license extension for the Vermont Yankee nuclear power plant, it's time to look at what's going on between the state of New York and Yankee's owners, Entergy. Wrapped in with the license extension Entergy wants for the plant is a plan by the company to spin off Yankee and four other of its nuclear properties—Pilgrim in Plymouth, Mass., Indian Point and Fitzpatrick, both in New York State, and Palisades in Michigan—into a new company, Enexus. And according to its Securities and Exchange Commission filing, Enexus' instruments will not be investment-grade; that, as noted nuclear industry analyst Dan Scotto of Whitehall Financial Advisors told the Advocate, "after all is said and done, is not helpful." NYSEG and RG&E have kicked off a replacement and rebate program for lighting and refrigerators in five- to 50-unit apartment buildings and condominium complexes. The program includes rebates of up to 50% of the cost to replace common area lighting with energy efficient lighting, installing up to six compact fluorescent light bulbs (CFLs) in living areas and refrigerator replacements (for low-income customers) or rebates of up to $300 towards replacement costs for eligible models. Participants must own a qualifying property with NYSEG or RG&E electricity service or be a NYSEG or RG&E residential electricity customer who resides in a qualifying property. Apartment and condominium buildings with less than five units and more than 50 units per building are not eligible for this program, but may be eligible for other state-funded energy programs. Eligibility information, other program details and answers to frequently asked questions are available at nyseg.com and rge.com. Information is also available by calling 1.800.995.9525. All equipment replacements and installations will be performed by RISE Engineering, a contractor representing NYSEG and RG&E. Rebates are being offered in accordance with a July 2009 New York State Public Service Commission order approving multifamily efficiency programs for utilities across the state. The program is funded by the System Benefits Charge on electricity customers’ bills. A New York state Department of Environmental Conservation statement that is currently pending approval could increase regulations for oil and gas companies planning to drill in the Finger Lakes region. The statement, written in September of last year, was created to address growing public concerns about pollution and take steps to ensure drilling sites are well regulated. The statement was made public and open for comment. Though it covers possible regulation options and assesses environmental threats like the contamination of drinking water, a host of resident complaints and expert testimony allege that the document glosses over several key concerns. Hydraulic fracturing is a process used by drilling companies to help natural gas trapped underneath rock formations move to wells where it is collected after drilling. A fluid composed of sand, water and a series of chemicals is injected thousands of feet into the rock, boring small pathways through the shale and unleashing natural gas. The series of chemicals, which can contaminate groundwater, are designed to prevent cracks in the shale from closing. The fluid that doesn’t remain in the ground is collected in pools of waste following the procedure. Steuben County officials are preparing for the impact natural gas drilling could have on county-wide issues for decades to come. Portions of the vast natural gas deposit located in the Marcellus Shale are located under Steuben County. The deposit ranges in a wide arc from West Virginia to Lake Erie, and could be one of the largest gas fields in the U.S. So far, no drilling sites in Steuben County have been identified, but a depleted gas well in the town of Pulteney is being looked at now for disposal of waste water resulting from the drilling process. New York is budgeting for 35 new positions in the next fiscal year to help oversee production of the Marcellus Shale, if and when it gets there. While political and regulatory uncertainty clouds the fate of Marcellus production north of Pennsylvania, the staffing proposals are a sign that Gov. David Paterson's office is preparing. "If drilling moves forward, we have the infrastructure in place to do it in a safe and responsible way," said Morgan Hook, a spokesman for the governor. The staffing initiative would add 29 workers to the Department of Environmental Conservation, four to the Department of Health, and two to the Public Service Commission. The $3 million annual payroll would be offset by a severance tax on gas extracted from the ground. The staff of the state Public Service Commission is recommending drastic reductions compared with what New York State Electric & Gas and sister company Rochester Gas & Electric are seeking in the way of higher rates for electricity and natural gas. The PSC recommends granting only 8 percent of RG&E's request. NYSEG was pared to 12.8 percent of its request. A final decision by the five-member commission isn't expected for months. Overall, RG&E proposed a 22 percent increase in electric rates and a 44 percent increase in natural gas rates. NYSEG's corresponding figures were almost 25 percent for electricity and 33 percent for gas. If approved, the increases for the two companies would be the first since the mid-1990s. Concern over environmental damage from natural-gas drilling in the Marcellus Shale region has increased enough to attract federal attention, but at least one state representative believes regulation should be left to the states. The state Department of Environmental Protection is strengthening its regulations for well construction, and Gov. Ed Rendell responded to the concern last week by announcing a plan to begin hiring 68 more DEP workers for inspections and compliance of gas drilling. The U.S. Environmental Protection Agency announced last week an “Eyes on Drilling” tip line for citizens to report – anonymously, if preferred – anything that “appears to be illegal disposal of wastes or other suspicious activity,” according to an EPA news release.